Duval Paving, LLC has been pouring concrete for 8 years. Our professional paving crew can install a functional or decorative concrete surface for all of your Green Cove Springs hardscape needs. 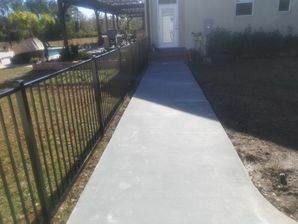 For Green Cove Springs driveways, pool areas, walkways, sidewalks, patios, and more, call Duval Paving, LLC for professional concrete installation. We serve residential and commercial clients in Green Cove Springs, Florida. With a custom concrete installation, Duval Paving, LLC can make your Green Cove Springs hardscape as decorative as it is functional. Duval Paving, LLC has been in the paving business for 8 years, making concrete surfaces in Green Cove Springs, FL look great. Duval Paving, LLC also provides non-decorative concrete installations for Green Cove Springs driveways, Green Cove Springs sidewalks, Green Cove Springs walkways, and Green Cove Springs patios. Call (904) 201-2161 to discuss your concrete surfacing needs. We'll help you choose the right concrete installation for your job. Whether you're looking to pave a Green Cove Springs residential or Green Cove Springs commercial hardscape, the concrete experts at Duval Paving, LLC will make sure that your project is handled professionally from start to finish.